Matthew Gillis, assistant professor of history, recently published a book about Gottschalk of Orbais, who Gillis calls “the Carolingian Empires’ greatest troublemaker.” Gillis sat down with Jacob Latham, assistant professor of history, to talk about his fascination with the ninth-century religious outlaw. Who was Gottschalk of Orbais, how did you find his story, and why were you drawn to it? Gottschalk was many things—a monk, missionary, priest, poet and hymnist, theologian, heretic, martyr—but I prefer to think of him as the Carolingian Empire’s greatest troublemaker. Everywhere he went in ninth-century Europe, he stirred up controversy. I must admit I found that pretty irresistible. 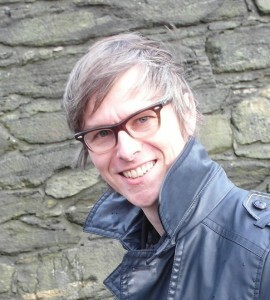 I first discovered Gottschalk as a graduate student. He was an interpreter of Augustine’s teachings about grace and he wrote beautiful Latin, but what hooked me was that he claimed he would perform miracles to prove he wasn’t a heretic. They never let him try. How does your subject’s story illuminate the wider changes taking place in ninth-century Europe? Gottschalk’s career was inseparable from the violent dissolution of the Carolingian Empire. He preached that Christ did not die for all baptized Christians in an era plagued by bitter political rivalries and anxieties about sin and disorder. This was a startling, even terrifying thing to say. Gottschalk’s goal was to separate God’s elect from the reprobate during those times of upheaval. While he won supporters, his controversial teachings and his aggressive way of promoting them horrified many bishops, who saw him as a diabolical agent spreading sinful errors. Gottschalk’s punishment as a heretical priest and wayward monk by church officials was a key moment in the Carolingian regime’s efforts to restore order in their now politically-divided world. What are the challenges and value of studying a “religious outlaw”? Gottschalk had powerful enemies who condemned him at church synods and in their writings. I had to read this evidence “against the grain” in order to avoid seeing him only from the official position. Luckily, sympathetic monks smuggled Gottschalk’s pamphlets from his prison and collected them. Some of these works survive, which was unusual for a medieval heretic. Studying the Carolingian church through a religious outlaw helped me identify how the church dealt with internal dissent through coercive reform. 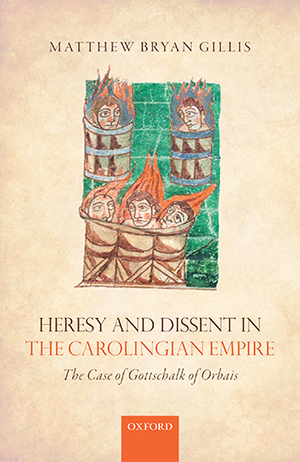 Unlike the later medieval church, which excluded and executed heretics and dissenters, the Carolingian church sought to correct perceived religious threats and only imprisoned those rare individuals who refused to be disciplined. What did you learn from the “Carolingian Empire’s foremost religious dissenter”?